Ademar of Chabannes (c. 989–c. 1034) was a prolific writer, whose hand can be discerned in more than 20 codices. He is mostly known for his Chronicon, and also for his work as a liturgist, composer and indefatigable supporter of his patron saint Martial. 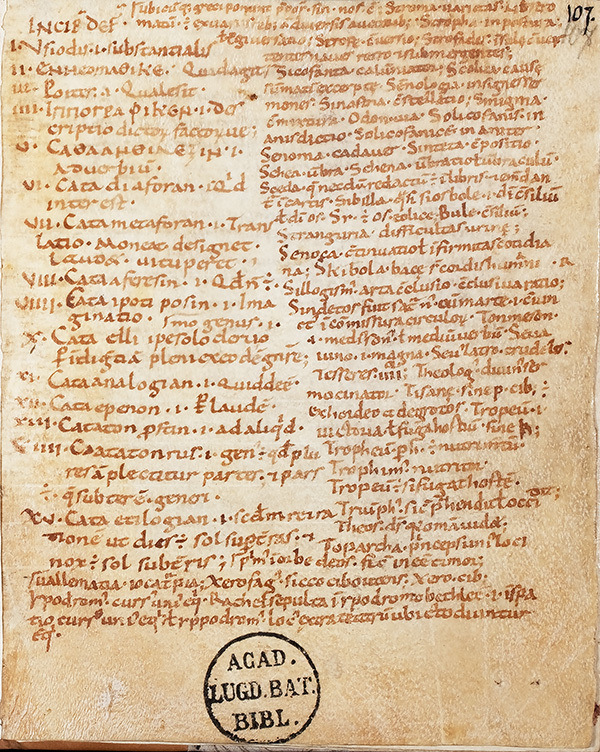 The present manuscript, the abundantly illustrated MS Leiden VLO 15, is now divided into fourteen fascicles. Together they bear witness of Ademar’s less well-known activity as a teacher at the monastery schools of St.-Cybard (Angoulême) and of St.-Martial (Limoges). The fascicles contain standard textbooks such as the fables of Avianus, the Psychomachia of Prudentius, the De astronomia of Hyginus and the Aenigmata of Aldhelm. Most quires of the fascicles have a very diverse, informal and unsophisticated appearance. For this reason they have sometimes been characterised as ‘notebooks’. This apparent lack of concern with presenting a well-organised text suggests that they were intended for personal use. Ademar worked with a stack of quires provisionally bound with tackets. This device facilitates a flexible use of the texts, whereas a fixation of the quires into a definitive binding, as it is the case now, may cause confusion because a continuing text can be found on two or more different places in the manuscript. Examples of dispersed items are the Bible glosses, the Arabic astrology and a fragment of theScholica graecarum glossarum. We can take the last text as an example to illustrate Ademar’s creative re-use of the available parchment. At the centre of the first recto of fascicle XI, fol. 107r, a page initially left blank, Ademar copies an introductory list of all kinds of definitions. 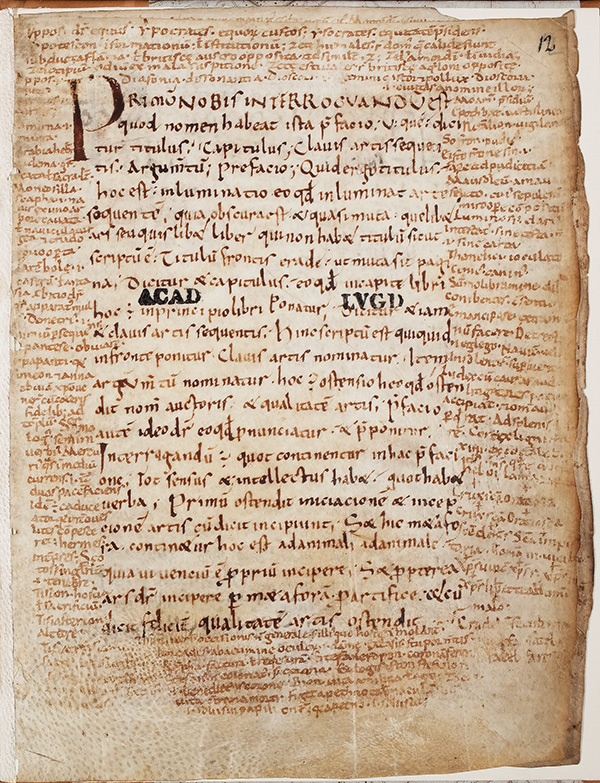 This text was originally from Marius Victorinus, but Ademar borrowed it from his own copy of Isidore’s Etymologiae. Surrounding these definitions, Ademar notes an alphabetical Greek-Latin wordlist, the so-called Scholica graecarum glossarum. Subsequently Ademar reuses another quire, a leftover with a fragment of the Ars grammatica of Donatus, to continue this wordlist in the upper margin (fascicle III, fol. 12r). The other margins on this page were used by Ademar mostly for jotting down Greek-Latin word explanations from the works of Bede and Jerome. The main text, the Ars grammatica, is not in the hand of Ademar and has nothing to do with the ‘glosses’in the margins. Post by Ad van Els, earlier this year he earned his doctoral degree from the University of Utrecht with his dissertation "Een leeuw van een handschrift. Ademar van Chabannes en MS Leiden, Universiteitsbibliotheek, Vossianus Latinus Octavo 15" (A Lion of a Manuscript: Ademar of Chabannes and MS Leiden, University Library, Vossianus Latinus Octavo 15 [with a summary in English]).